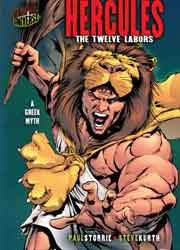 This graphic adaptation of HERCULES is a quick, action-oriented tale of strength and cleverness. Hercules moves from task to task, defeating his foe, much to the chagrin of Eurystheus. The pacing makes this story easy for a wide range of readers and builds interest in Greek mythology and also in reading. What I appreciate in the story design is the desire I feel to learn more – more about Hercules and Greek myth. Motivation and inspiration are keys to children reading. The writer carefully edited the story of Hercules’ descent into madness, killing his wife and children. In this adaptation, Hercules simply goes to the oracle for some unknown reason. Most likely, this edit was made in order to make the book more suitable for children, but it certainly leaves some questions, which are not necessarily a bad thing. The art in HERCULES: THE TWELVE LABORS, like the other titles in the series, are realistic. The inks and colors are rendered to look real rather than cartoony, which helps with older readers. Like many titles, I offer an age recommendation, but that is just a recommendation. If a child shows interest I recommend allowing them to explore it. Myth is one of those subjects that fascinate some children and that interest should be nurtured and encouraged, regardless of Lexile ratings or age levels. It’s Greek mythology, so there are gods and goddesses, mysticism, magic, and the like. So many uses in the elementary and middle school classroom, it’s boggling. My friend, Paul Epps, created a lesson plan (as part of a unit) comparing and contrasting myth with science. He used HERCULES as part of that lesson, which will be published in a textbook on literacy Spring 2009. The students analyze the purpose of myth and science to a culture and the differing roles each play within that society. Can a human being really do the things that Hercules did? What is the science behind the twelve labors? Myth strikes interest in children, especially boys. Students are drawn to the mythological creatures and characters, which makes this book (and the others in the series) important. Not only are communication arts lessons a plenty with this title, but history, politics, sports, and science. Included is a synopsis of the mythos of Hercules, a glossary, index, resources for further study, and background information on creating the graphic novel, and information about the creators. For the target audience, this book is a perfect addition to the classroom.